Highveld Lions 5-139 (Gulam Bodi 50, Neil McKenzie 46*, Umesh Yadav 2-20) beat Delhi Daredevils 9-117 (Kevin Pietersen 50, David Warner 21, Chris Morris 2-7) by 22 runs. The Lions scored 139 runs after losing half of their side in the allotted 20 overs and Delhi Daredevils managed 117 runs with one wicket left. Neil McKenzie (Lions) was declared ‘Player of the match’ for his attacking unbeaten innings of 46 off 28 mere deliveries. The first semi-final of the Champions League Twenty20 2012, was played at Kingsmead, Durban, on Thursday, October 25, 2012. The skipper of Delhi Daredevils, Ross Taylor, won the toss and invited the rivals to set a target for them to be chased. The innings of the Lions was opened by their promising batsman, Gulam Bodi, and their captain Alviro Petersen in a dominant way as the latter got two fours in the very first over. The next three overs resulted in 12 runs as Petersen hit 12 runs in the following over with 1 six and 1 four. He was caught behind by the wicketkeeper Naman Ojha off Umesh Yadav for 24 off 19 balls with 1 six and 3 fours as the total reached 34 in 5.2 overs. Quinton de Knock came in next and scored two back to back fours in the 8th over and Bodi got the same outcome in the next over. They took the score to 58 as the first was gone for 11 and the Lions lost the third wicket with the addition of five runs. Neil McKenzie connected with Bodi and they lifted the flow of runs and accumulated 10 runs in the 16th over with 2 fours. McKenzie sent the first ball of the next over flying over square leg as Bodi attained his 11th T20 fifty and third in the tournament in the same over. Gulam Bodi was dismissed on the last ball of the 18th over for 50 off 49 deliveries with 1 six and 4 fours. Neil McKenzie remained unbeaten for 46 off just 28 balls comprising 1 six and 4 fours as the Lions reached 139 with five wickets in hand. Umesh Yadav was the highest wicket taker with two whereas Morne Morkel, Ajit Agarkar and Pawan Negi held one wicket each. Delhi Daredevils faced a big blow when their ace opener, Virender Sehwag, was caught at mid-on by Alviro Petersen off Sohail Tanvir without having a run against his name. Kevin Petersen joined in next with David Warner who scored 10 runs in the second over with 2 fours. Petersen registered his first four in the 3rd over and the duo added another 13 runs in the fifth over with 3 fours. The score was enhanced to 36 in 5.4 overs when David Warner was caught and bowled by Chris Morris for 21 runs. Petersen secured his end and kept the score board running as there was a mini collapse in the middle order. Delhi Daredevils were at the receiving end after losing five important wickets for 76 in 14 overs. Unmukt Chand scored nine runs whereas Irfan Pathan and Ross Taylor shared one run each and put their team under a lot of pressure. Kevin Pietersen was dropped by Jean Sumes off his own bowling on the first ball of the 15th over at 43 runs. He banged his 13th T20 half century in the next over but multiplied the worries of his team after becoming the 8th batsman to return to the dressing room for 50 off 44 with 1 six and 3 fours. Delhi Daredevils required 36 off the last 12 balls to get into the final as the 9th wicket was down on the first ball of the 19th over. They managed 117 runs for the loss of nine wickets besides having a powerful batting line up. Dirk Nannes, Chris Morris and Aaron Phangiso shared two wickets each as Sohail Tanvir, Jean Symes and Dwaine Pretorius claimed one wicket each. 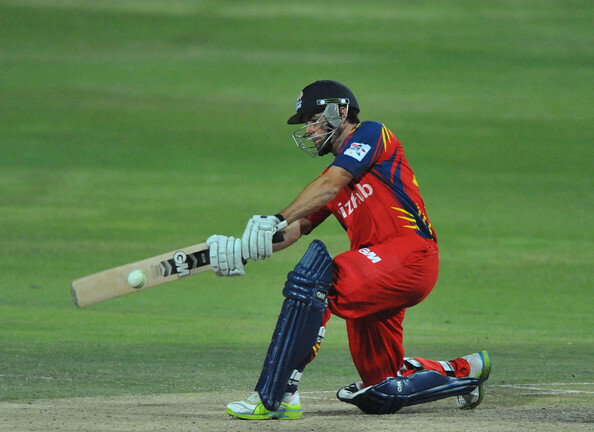 The Highveld Lions proved their worth in all departments of the game, won the important match by 22 runs and got their berth in the final for the first time ever. See the ball, hit the ball doesn’t work always. Veeru flopped, DD bowlers and fielders were bunch of amateurs. Overall DD went into the game with a mindset of looser and hence they lost. Overall pathetic game from DD despite having shitload of international stars, hard hitters and great bowlers. Ah! well after all that’s Cricket. Its very bad performance for Delhi. Its very disappointing that sehwag got a golden duck. But I think all the responsibility for this lost game should be given on Taylor because of his wrong decision after won the toss. Though the history said that batting first is bless for that ground, Taylor took decision to bowl first. After that viru made a duck and fell the team into a critical situation. At last I have to say best wishes for Kp to give us a hope in the middle time of daredevil’s innings. What is gone, gone for ever. So go ahead Delhi. Go ahead viru. Go ahead all the members of daredevil’s.